Huidige pagina Let’s Get Busy Using Influencer Marketing! Close your eyes for a second. Think back to the last time you made a big purchase. What made you pull the trigger? Did you see a great ad or did someone recommend that you to make that purchase? Chances are that it was a recommendation that made you buy. McKinsey states that on average 26% of the purchase decisions arise from social recommendations. Nielsen states that 92% of the interviewed people say they trust ‘earned media’ such as recommendations from friends and family more than any other forms of advertising. Getting these recommendations is a big deal for your brand or firm. Because of this you as a marketer are always on the lookout for generating a positive word-of-mouth. Using Influencers for your brand can be one way of generating this positive word-of-mouth. But who are these influencers, how do you use them, how does influencer marketing work and most importantly where do you start? Let’s start by taking apart the term ‘influencer’. According to BusinessDictionary.com, influencers are individuals who have the power to affect purchase decisions of others because of their authority, knowledge, position, or relationship. Reading this explanation it becomes obvious that influencers can influence others in different ways. 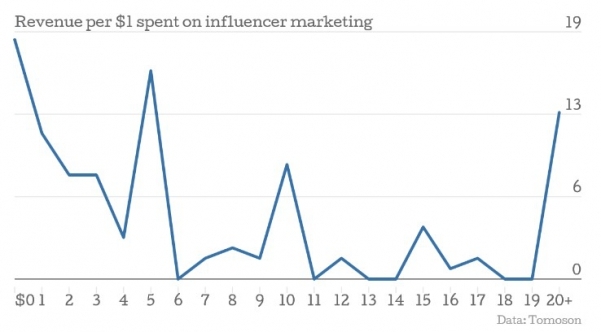 In 2014 Kyle Wong published an equation to calculate the amount of influence that influencers can generate. According to this equation, influence has three conditions. Because of this it is important to look further than the number of followers an influencer has. Keep in mind to also take the influencers expertise, and credibility (for your brand, product and/or company) in mind. And know how strong that bond between influencer and follower is. What value can these influences bring you? According to Tomoson, companies earn an average $6.50 for each dollar that is being spend at influencer marketing. Profit can therefore be a great reason to start using influencers! Before I describe the first steps you should take to find the perfect influencers it is smart to dive into a real-life case. This will give us some more insights on how influencer marketing can work for your brand. Karvan Cévitam is a Dutch food Brand that offers syrups since 1948. 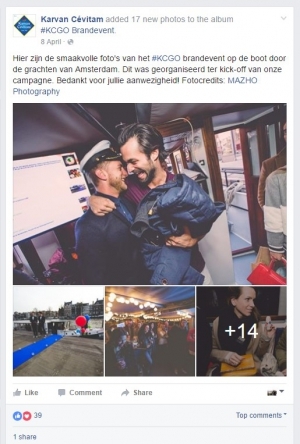 For the launch of their new Karvan Cévitam GO (KCGO) product the brand invited Dutch influencers for a boat trip through the Amsterdam channels. During this event the influencers produced loads of content that reached a large audience. Besides using these influencers Karvan Cévitam also invited its entire audience to publish social media content using the #KCGO hashtag. Doing this the audience had a chance of winning rides in a KCGO-limousine. The effect of using these influencers can be clearly measured with Coosto. The campaign ran during the month of April, starting at the 31st of March with the influencer event. The image above clearly shows an activity peak starting on that date. The entire KCGO campaign resulted in almost 500.000 social media impressions. With this Karvan Cévitam managed to reach a large audience on social media. Besides this the brand managed to enthuse the targeted audience to use the Karvan Cévitam products and publish content about it. Doritos used several influencers in 2015 for the Dutch #playbold campaign. The brand had several famous Dutch Youtube celebrities do some exciting challenges for this campaign. Both Doritos as the influencers made video content of these challenges which they later shared with the world via their own social media channels. The brand reached a large amount of young people by doing this. One example of the reach the achieved are the videos on the Youtube channel Fifalosophy which received 171.000and 165.000 views. Doritos activated the target audience by asking them to vote on their favorite Youtube celebrity on www.doritos.nl. This resulted in 492 of the total 1635 messages about the campaign containing a link to their website. The total campaign resulted in over 4,4 million impressions on Twitter during one month! Coosto shows that 39 per cent of the total messages had a positive sentiment. This indicates how the audience thought of the campaign. To keep increasing their social reach Daniel Wellington continuously keeps contacting new influencers from all over the world. These influencers receive a financial compensation as well as a couple of watches to promote in their social posts. Besides this all of the fans which post content relevant to the brand and use the hashtag #DanielWellington have a chance of being featured on Daniel Wellington’s own Instagram page. Something many of their followers can only dream about! But what is the value of all of these fans for Daniel Wellington? Well, the company managed to increase its profits by 214% between 2014 and 2015. A great sign of a good strategy and a great way to show the power of influencer marketing. Karvan Cévitam presented us with a great case to show one of the applications of influencer marketing. But how do you start using influencers? The best way to show you is through a very simple example. Let’s say you are a clothing brand and have a new line of summer clothing coming up. Using influencers may be a great way to promote this and therefore you wish to use female influencers for your campaign. A great first step is to build a simple search query in Coosto that will find you all of the messages talking about summer clothing. Need some help building this query? Contact us and we’ll gladly help you with this! As soon as you have the search query up and running you select the ‘Authors’ button within the tool and are presented with the authors that wrote all of the messages. When you sort this list based on influence you will see an overview of the social media users that talk about your subject of interest and have a relatively large amount of influence on their followers! Now you have the perfect starting point to select the influencers for your goals. Remember to closely look at who these influencers really are and make sure they fit your brand and goals. Read their content and get to know them. This way you get insights into the expertise, credibility and the strength of the bond between the influencer and its followers. Influencers can help you reach a highly targeted audience in a personal manner. They are capable of bringing your brand to life and research shows that the effects of using influencers can be tremendous! Just know that a well thought through strategy is the foundation of the effective usage of influencers. Are you curious about the possibilities that Coosto has to offer? Perhaps some insights on how to start using influencers through social media? Request a free demo or watch our video here!